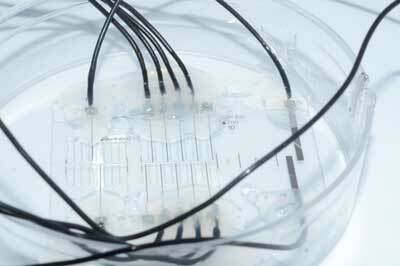 (Nanowerk News) Neuroprosthetics - implants containing multi-contact electrodes that can substitute certain nerve functionalities - have the potential to work wonders. They may be able to restore amputees' sense of touch, help the paralyzed walk again by stimulating their spinal cords and silence the nerve activity of people suffering from chronic pain. The nerve-on-a-chip platform developed at EPFL can be manufactured in a clean room in two days and is able to rapidly record hundreds of nerve responses with a high signal-to-noise ratio. However, what really sets it apart is that it can record the activity of individual nerve cells. The research has just been published in Nature Communications ("A microfabricated nerve-on-a-chip platform for rapid assessment of neural conduction in explanted peripheral nerve fibers").